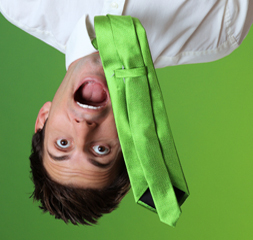 Are You Marketing Upside Down? Home » Marketing » Are You Marketing Upside Down? With so many new and exciting ways to get your message out to your potential clients, it’s easy to want to just jump into new endeavors with both feet. While this shows great enthusiasm, you need to know where you want to land before you leap. I often see clients working on their marketing upside down– from the bottom up. They want to have a nice brochure or they want to start posting on social media, but they haven’t figured out how these items work into their overall marketing yet. They haven’t set any goals to measure their success or decided what they really want to say to their target audiences. Unfortunately, if treated as standalone items, marketing activities can often fail, leaving you with little to show for your effort, time and investment. To avoid this scenario, your marketing activities and communications need to be a part of your overall marketing strategy. They need to carry your brand message clearly through to your audience at every point of contact in order to succeed. This holistic approach will ensure that each message you put out into the world — whether a brochure, a social post, an article, or an email campaign — is working toward reaching your overall goals and elevating your brand. It’s not a snap of the fingers, but even answering the following key questions can help you begin to shape your marketing overview and really focus on your desired outcomes. What do I hope to achieve with my marketing? Who is my target audience? How can I best reach them (i.e. social media, live events, etc.)? What is important to them? What problem(s) do I solve for them? What overall message do I want to convey? What do I want to make sure my clients know about me and how I can help them? Save your answers to these questions and each time you want to start a new marketing activity, refer to them. Ask yourself if your new materials fit into this overview. If not, decide if you can change your materials to fit or if they’re completely off mark. Don’t be afraid to scrap something if it doesn’t enhance your marketing goals. It’s great to be excited about your business and all of the new ways you can deliver your message to your potential clients and customers. Just make sure that you’re not marketing upside down. Starting at the beginning and developing your plan will prevent you from spending your time, effort, and money on scattered messages that don’t provide the impact you need to reach your goals. What’s Missing from Our Marketing Messages?